Fans of Kelli Williams, who’s best known for “Army Wives,” “The Practice” and “Lie to Me,” can see her on her new series beginning Aug. 12 at 9 p.m. ET on the Up network. The show is the network’s first original series, and it’s called “Ties That Bind.” The 10-episode series centers on Kelli’s character, police detective Allison McLean, who is balancing a demanding and dangerous job and a family. When she must arrest her brother, Tim (special guest star Luke Perry), for aggravated assault, her world drastically changes as Tim is convicted and sent to prison, leaving his two teenagers teetering on the brink of foster care. Allison now feels compelled to do the right thing as a sister and aunt: She brings Tim’s two very unhappy teens into her home. 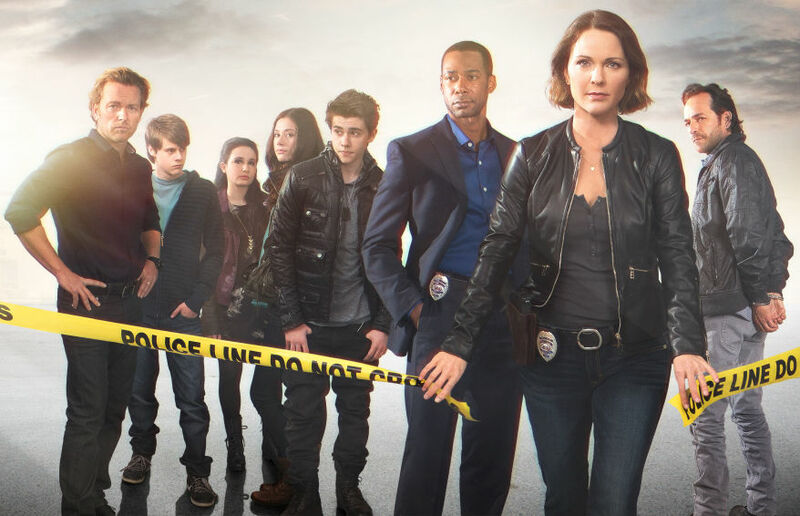 I spoke with Kelli recently, and she is excited for fans to see this not-so-typical police drama. Celebrity Extra: Tell me about the series: What did you think when you read the script, and what made you want to be a part of it? Kelli Williams: My interest was immediately piqued to play this detective because I’ve never played a detective before. So I quickly said yes. I met with Barbara Fisher (senior vice president of original programming at Up) and Sheryl Anderson, our producer/writer extraordinaire. And Sheryl said something to me that was really sweet: She said that when she was writing this part, she had me in mind. She had my picture in her office hoping that I would play this part, which is so cool. How nice is that to be the inspiration for the writer? And then to get to play the part to boot was really, really great. I was really curious about this whole hybrid cop drama/family drama and how the two would work in everyday terms of trying to kind of manage career and family. I know from experience — I have three kids and I have a job. We all try to do the best we can with being the best mom you can be and also doing the best in your work that you can do. Sometimes you have days where it’s like: “I got it. Good. This is teamwork.” And then there are days where it’s like: “Oh my God. This is not working.” So, I liked the idea of the family’s story throughout all of our episodes. It feels like a perfect show. That’s a funny thing to say, but you set out to do something and hopefully have the product work, and it really feels like it does. CE: Tell me about your character, Allison McLean. KW: Allison is a pretty tough lady, in a lot of ways. She’s certainly tougher than I am, in terms of the job. She has qualities that I aspire to. She calls it like it is and speaks her mind immediately. I’m not saying that I’m not strong, there’s just a quality about playing a detective like this and then having the softer side of her world. She has this really strong long-term relationship with her husband. They’ve worked hard at their marriage and raising their kids and becoming good people. They don’t always necessarily get it right, but they do their best. Those values are really nice things to show. CE: Is the format of the show where you solve a case each episode, but the family drama is underlying throughout the season? KW: Yes, exactly. The family part of it is a continuation, but each episode is a different case. And then her kids have their own stuff that happens, and then there’s the ongoing world of her niece and nephew moving in with them and what that does to their family dynamic. It happens pretty quickly. CE: Tell me about the family dynamic between Allison and her brother, Tim, as well as what it means to bring his teens into her home. KW: So, Luke Perry, who plays my brother, Tim, doesn’t want me to take the kids in, and I insist on it. He’d rather they just stay in the system than be with me. There’s this kind of tension that we get to play where he’s like, Why do I always have to be so right? Why do I always have to follow the rules? But I want the kids with me, and it’s a little bumpy at first because the kids have been raised in a different world. CE: This has to be placing stress on her marriage and home life. KW: We’re all trying to keep it intact. We definitely have a lot of plates spinning. And all of our lives are messy. We all try to keep everything going. You’ve just got to keep moving along, otherwise everything is just going to fall apart. KW: The cast is fantastic. Jonathan (Scarfe, who plays her husband) is a delight to work with. He’s great. We’re always having scenes, like, around the dinner table, and we’ll give each other a little nod like, “OK, we’re going to survive all the crazy kid action and energy.” And of course, the kids are great, and they’re all so talented. And then Jason Priestley comes in and he plays a pretty pivotal and important character from my past. That was a really fun night of filming. He’s a really nice guy, but he won’t come off that way onscreen. Things go down, but I can’t give you more information than that. C. Thomas Howell came in for a guest role. I’ve never worked with him before. And that was really fun to do. And then Dion Johnstone, he plays my partner, Devin. He’s just great. I have to say, from Dion to Jonathan to the kids, it all really works. We’re not faking it on that set. We’re creating a new world, but we all get along really well. It’s a really good group. CE: This is Up’s first original series; tell me what it’s like working with them and being a part of this inaugural event. KW: The exciting thing about Up is that they’re rebranding the network, and this is a new frontier for them, their first scripted series. They have done movies and other more reality-based stuff, but this is the first scripted series. It’s a really exciting place to be, because the network wants to expand and be known as a place for good drama with good values. The whole family can watch it. It’s been a really great process for me personally. They’ve been so welcoming. It’s a close group of people, and it’s so exciting, like we’re in on the ground floor of something new. I hope our show can bring in an audience and that they can build on that audience with other series. There’s a whole world that’s available. Hopefully we can make them proud.